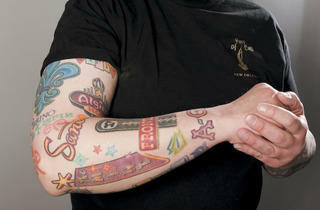 The ubiquitous barroom door guy preserves old Vegas on his arm. Blue Ellis On his first trip to Las Vegas in 1994, Ellis gazed into the neon-lit Nevada sky at the iconic, gleaming sign of his hotel, the Stardust. “The minute I saw the way it lit up, the intricacy,” he says, “it was just something I had a strange connection with.” Before the Stardust was closed to the public in 2006 (and demolished in March ’07), Ellis was among the hotel-casino’s last guests. “It made me really sad. The heyday of Vegas is disappearing very quickly,” says Ellis, whom you might recognize as the door guy at the Gingerman, Hopleaf or Tiny Lounge. 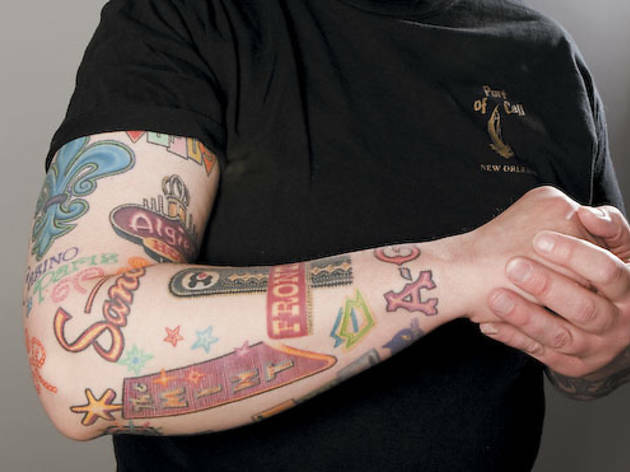 Since then, he’s turned his right arm into a sort of Sin City preservation project, a tattoo version of Vegas’s Neon Museum “Boneyard” exhibit. Along with the Stardust sign piece, the tats collage building elements, matchbook graphics and other details from classic resort casinos: the Algiers, the Dunes, El Morocco, La Concha, the Riviera. As Elvis once put it, viva Las Vegas!